Stages are activities that are done sequentially per work item. In a typical release, there are several work stages that could happen in a sequence. Stage 2 is Implementation, where developers now create or update the software, based on the design that's decided in stage 1. Stage 3 is Testing, where quality engineers then test the software, based on agreed scope, requirements, and design. Skills, on the other hand, are abilities that team members must have in order to complete work items. Skills can be defined per stage and allow to categorize different types of work within a stage. Skills are useful in cases where the team's members abilities can cause bottlenecks in planning. You will have to take into account that your team has the appropriate specializations. Enter a name for the new stage. If necessary, change the color for the stage by clicking on the color ball and selecting a new color. Enter a name of the skill, and click Create skill. Set the percentage for the estimate allocation of the skill. 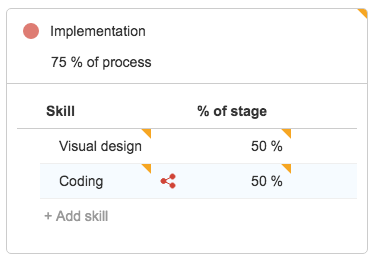 For example, if an issue has a total estimate of 10 points, and the implementation stage has two (2) skills visual design and coding, and each skill is 50% of the stage, this would happen: 5 points of the total estimate would require a person with visual design skills, and the remaining 5 points would require a person with coding skills. Once you've created a set of skills, you can add them to the stages. To delete a skill, hover over the skill > click > Delete. In this example, you have a fully cross-functional Scrum team — everyone in the team can do all types of work required to implement a user story. Stage 2, where the team implements the user story. All activities, such as UI design, coding, testing, and more are done within the same iteration. Configuring stages will be very simple in this case. You just need to add two (2) stages, without any skills. The resulting schedule will then look like this when some stories are added. The story writing stage will be scheduled at least one sprint before the implementation stage. However, this doesn't apply to stories that don't required any story writing effort. If you prefer not to estimate and reflect any story writing effort in your capacity plan, and instead plan for story writing separately, you can choose to leave out the story writing stage altogether. Story writing effort is not planned in Portfolio for JIRA. Implementation effort is planned in Portfolio for JIRA, and implementation is becomes stage 1. Portfolio for JIRA will now work out the scheduled based on the assumption that all required input (user stories, requirements, etc) will be available for the team as soon as the stories are scheduled. Although you can plan activities separately, we recommend that you include all types of effort, stages, and skills in your plan. One of the common challenges many teams see in their organization is being realistic and explicit about design work and user story writing. Having a single source of truth for all teams to see can help align effort — and Portfolio for JIRA can help your team achieve this better if all aspects are included in your plan. Let's say that in your team, everyone can take over some tasks, such as testing — but then, only specific members have the skills to take on design, coding, and dev test. To handle this in your plan, you can add the specializations as skills for the corresponding stage, which is implementation in this example. Let's say your team doesn't work in fixed iterations — and that they work on a day-to-day schedule, pulling in work from a backlog when tasks are completed. In this case, their work would be structured into design, implementation and testing – and these happen sequentially per work item. However, rather than waiting for the next iteration to start with the next stage of work, implementation can actually start on the right after design has been completed. 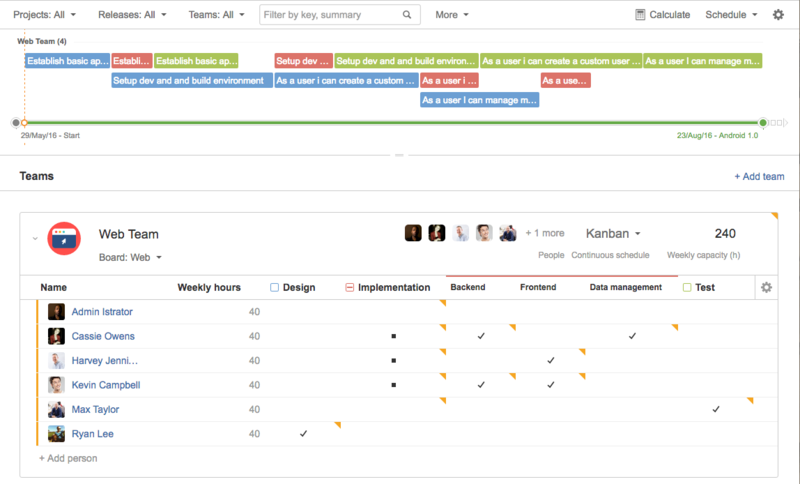 The schedule will look different for Kanban teams, with the stages scheduled sequentially per item. If there are free capacities, multiple stories can then be scheduled in parallel. The focus here would be completing stories end-to-end, from design through testing, in the shortest possible time.